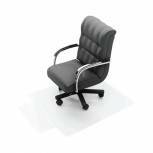 Q-Connect Chair Mat PVC 914x1219mm Clear KF02255 Pack of 1 Q-Connect PVC Chairmat. A practical solution to wear and tear on office flooring. Features include tapered edges, studded underside to secure the mat and a durable PVC surface. Size - 914 x 1219mm. Colour - Clear. Non returnable. 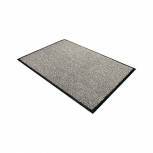 Doortex Dust Control Mat Roll 900x3000mm Grey 490300PPMR Pack of 1 Floortex 100% polypropylene Doortex mat with flexible anti-slip vinyl backing. protects hallways and reception entrances from dirt and moisture and ensures floors stay safe and clean. Size: 90 x 300cm. Colour: Grey. Doortex Value Mat 800x1200mm Grey FC480120VALGR Pack of 1 Doortex Value Mat. Tough, hard wearing mat soaks up excess moisture and removes dust particles. Made from polypropylene with flexible anti-slip vinyl backing. Size: 80 x 120cm. Colour: Grey. 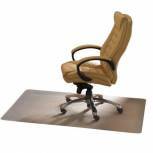 Cleartex Chair Mat For Hard Floors 1200x1500mm Clear Pack of 1 Hard floor protection for office chairs. Unique Floortex PVC material. Phthalate free: no harmful plasticisers. Smooth back for secure floor placement. Eco-friendly: 20% to 40% recycled material. Clear design. Dimensions: 1200x1500mm. Non returnable. Cleartex Chair Mat Carpet 1200x750mm Clear FL74288 Pack of 1 Floortex Value Chair mat with rounded edge is designed for use on carpets. Dimensions: 1200x750mm. Non returnable. Ecotex Evolutionmat Carpet Chair Mat Rectangular 1200x900mm FL74151 Pack of 1 Manufactured from enhanced polymer with up to 50% recycled content. Gripper back for use in carpets up to 9mm thick. Dimensions: 120 x 90cm. Q-Connect Chair Mat PVC 1143x1346mm Clear KF02256 Pack of 1 Q-Connect PVC Chairmat. A practical solution to wear and tear on office flooring. Features include tapered edges, studded underside to secure the mat and a durable PVC surface. Size - 1143 x 1346mm. Colour - Clear. Non returnable. Cleartex PVC Chair Mat Hard Floor Lipped 920x1210mm Clear 1299225LV Pack of 1 PVC hard floor chairmat with lip protects hard floors from chairs. Non returnable. 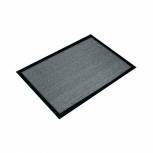 Doortex Dust Control Door Mat 600x900mm Black/White 46090DCBWV Pack of 1 Proven to be highly effective in preventing dust and grit being walked into your premises, stopping dirt in its tracks and helping maintain a cleaner working environment. Slip resistant. Size - 600 x 900. Colour - Black/White. Cleartex PVC Chair Mat Carpet Lipped 920x1210mm Clear 119225LV Pack of 1 Protection for your carpet. Non returnable. 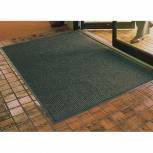 Doortex Dust Control Door Mat 900x1500mm Black/White 49150DCBWV Pack of 1 Proven to be highly effective in preventing dust and grit being walked into your premises, stopping dirt in its tracks and helping maintain a cleaner working environment. Slip resistant. Size - 900 x 1500. Colour - Black/White. VFM Charcoal Deluxe Entrance Matting 610x914mm 312081 Pack of 1 Ribbed mat removes dirt, grit and moisture. Outstanding durability - suitable for both indoor and outdoor installations. Polypropylene with heavy duty slip and stain resistant PVC backing. Dimensions: 610 x 914mm. Colour: Charcoal. Non returnable. VFM Charcoal Deluxe Entrance Matting 914x1524mm 312091 Pack of 1 Ribbed mat removes dirt, grit and moisture. Outstanding durability - suitable for both indoor and outdoor installations. Polypropylene with heavy duty slip and stain resistant PVC backing. Dimensions: 914 x 1524mm. Colour: Walnut. Non returnable. 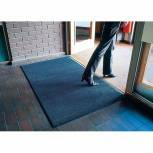 VFM Blue Economy Entrance Mat 1200x1800mm 312427 Pack of 1 Carpet surface made from 100% continuous filament. Slip resistant with a stain resistant PVC backing. Protects floor surfaces and carpets from dirt, moisture and general wear and tear. Size: 1200 x1800mm. Colour: Slate Blue. Non returnable. 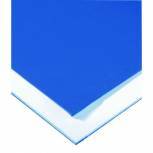 VFM Black /Blue Economy Washable Entrance Mat 1150x1750mm 312428 Pack of 1 Machine washable entrance mat, can be washed in domestic washing machines. Traps up to 90% of tracked-in-dirt, moisture and grease. Bleach and fade resistant. Non skid nitrile rubber backing. Size 1150 x 1750mm. Colour: Black/Blue. Non returnable. 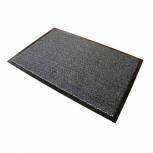 Black Rubber Worksafe Mat 312475 Pack of 1 Manufactured from extremely hard wearing rubber with moulded bevelled edges. Unique underside design prevents mat slipping. Allows swarf, oil, grease and debris to fall through. Thickness: 16mm. Size: 900 x 1500 mm. Colour: Black. Non returnable. 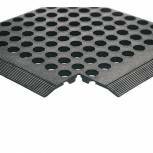 Rubber Worksafe Mat Black 312476 (Pack of 3) Pack of 1 Manufactured from extremely hard wearing rubber with moulded bevelled edges. Unique underside design prevents mat slipping. Allows swarf, oil, grease and debris to fall through. Thickness: 16mm. Size: 900 x 1500 mm. Colour: Black. Non returnable. 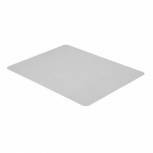 Clean Room Mat 800X600mm 313525 Pack of 1 Ideal mat for protecting an environment against dirt and bacterial pollution. Adhesive surface attracts and contains both dust and dirt. Each pad contains 60 sheets. Size: 800 x 600 mm. Colour: White. Non returnable. 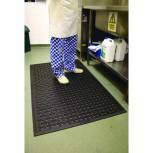 Kitchen Mat 850x1400mm Black 319138 Pack of 1 Reduce slipping on wet / greasy floors. Provides comfort during prolonged standing. Ideal for food preparation areas, bars and dishwasher locations. Open holes drain spilt liquids. Machine washable. Size: 850 x 1400mm. Colour: Black. Non returnable.